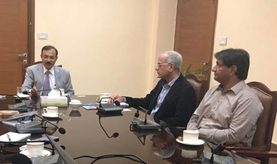 The Secretary to Government of Sindh Province, Pakistan for “School Education and Literacy Department” Mr. Qazi Shahid Pervez, in a meeting on October 15, 2018 with the President ECO Science Foundation (ECOSF) Prof. Dr. Manzoor Hussain Soomro and CEO Pak Alliance for Math and Science (PAMS) Mr. Salman Naveed Khan showed keenness to improve the content and quality of school education in Sindh Province. 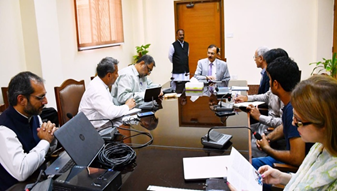 The Secretary welcomed the visiting officials in the meeting and emphasized on the need for quality STEM education in Government Schools of Sindh using the Inquiry Based Science Education (IBSE) methodology. In this respect, the Secretary sought assistance of Pak Alliance for Math and Science (PAMS) and ECO Science Foundation (ECOSF). On the occasion, the CEO PAMS made a presentation on the legacy of PAMS and its initiator Alif-Ailaan campaign for quality education especially Math and Science. Mr. Salman Khan informed the Secretary about a number of Science Fairs and Competitions among school students of Sindh held recently and proposed a project for expanding and popularizing the activity on behalf and support of Government of Sindh. President ECOSF Prof. Soomro elaborated on the methodology of IBSE for STEM education and emphasized on the importance of S&T based economic development and the role played by School Teachers. He also stressed upon the need for grooming the teacher trainers through Provincial Institute of Teacher Education (PITE). He further said that the ECOSF in 2016 had trained 3 instructors from PITE Sindh in a workshop on IBSE in Islamabad that was led by the French Trainers and would be appreciated if the PITE Sindh in collaboration with ECOSF and PAMS organizes an exclusive workshop for teacher trainers of Sindh as well as for Head Teachers of Sindh. The Sindh Secretary for School Education and Literacy Mr. Qazi was very receptive and agreed in principle with the proposals of PAMS and suggestion from ECOSF. He asked PAMS to submit a detail proposal along with budget details for funding by the department. It is pertinent to mention that ECOSF has been supporting PAMS for promoting STEM education in Pakistan.